Whether you’ve enjoyed some #VikingBiking or not, the time is approaching to prepare your ride for spring. Here is an overview of things to check as the temperature outside rises. If in doubt, take your bike to your local shop for advice and service. Check your frame for any cracks or dents that might have developed over the winter. If you find any, take your bike in for servicing if you can’t fix it yourself. If the frame looks okay, give it a good cleaning to remove any accumulation of salt, sand, or other debris. Check your brake pads or disc calipers for evenness of wear, and debris. If you see any ridges forming, or if they look uneven, they might need adjustment or replacement. When applying the brake lever, brake pads should touch the rim at the same time. Check your brake and shifter cables for crimps and cracks. If you find any, consider replacing the cable. Slack on the brake line can be adjusting using the barrel adjuster. Inspect your wheel rims for dents or scrapes. Spin each wheel to check for wobble. If your brake pads rub when spinning your wheel, your wheel might not be true. 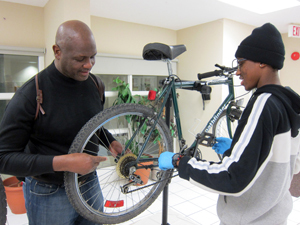 You can try adjusting the spokes yourself, or take your bike in for service. Check your tires for correct inflation pressure. Check the tread for cracks, cuts, punctures, uneven wear. Replace your tires if any are found. Lubricate all moving parts on your bike with dry lube. Namely the derailleur, brake lever pivot points and exposed cables. Wipe any excess lubricant off with a clean, dry rag. Degrease and re-lube your chain. Consider using wet lube if there is still slush or mud on the ground. Lift the rear wheel or put the bike on a stand and run through the gears. Shifting should be smooth and easy through all gears. Make any adjustments to the derailleurs and cable tension if necessary. Before riding, pick your bike up about 4-5 inches and drop it. Listen for rattles or anything that sounds loose. Double-check the brakes and tire pressure. Make sure your quick-release is tight. Be mindful of changes to sunrise times day-to-day. Keep your rear light on for up to 30 minutes after sunrise, especially if you expect to ride into the sun. Consider wearing water-resistant outer layers in case of wet weather. What else do you do to prepare your bike for spring? Let us know in the comments!